Marshall is not a new name for the audiophile crowd though could be a stranger for others. The company has successfully stepped into space for speakers and headphones. Its several launches in this particular field are a big hit in the market. Sometimes, even the big names sacrifice performance in favor of a great look for the design conscious flocks. Marshall has not done the mistake. In this article, we will try to compare its two popular speakers – Kilburn and Stanmore. On this front, Kilburn scores either a high point or a big zero, depending on whether you love a traditional look or something modern. For the second group, who will never like its grumpy look evoking a feeling of nostalgia, we would request to touch its velvet strap and brushed metal finishing. We hope you will change your mind. Weighing nearly 3 kg, it is not something to carry on a road trip. People love slimness and portability. However, if portability is a big miss, performance is not a small gain. The inputs and controls arranged on top of the model get smart finishing in brush metal. You will find it pleasant while using the controls. Flipping the on switch, you can select either Bluetooth or aux input for use. Like Kilburn, Stanmore is also a heavy model. The incredibly larger speaker does not look amazingly good. In fact, if you don’t love Kilburn for its look, you will have the same feel following a look at Stanmore. But we think the look is not everything and performance is a great deal. The speakers are meant for clear and big sound. All we can say it will not disappoint you a bit. The wood-made model features a black vinyl cover. Its rounded corners will look familiar. The retro brass knobs along with gold edging make it a classic piece. A remote control is conspicuously missing but its volume, treble, source knobs and bass make the model a clear stand-out in its league. You will find two tiny buttons along with an aux input to attach a laptop or phone. The speaker also integrates a button to facilitate switching from multi-room to single source models. Kilburn is fitted with features for independent treble and bass controls. It allows the users to customize sound to their tastes. Therefore, it is difficult to score the speaker on the basis of its neutrality. We set the treble and bass to 50% to see what it offers and the sound was almost deafening. Even at half of its potentials, the speaker produced powerful bass. You will also feel amazed at its shimmering highs as well as an excellent sense of space. Many portable speakers produce feeble sound. Kilburn, which is a performer at the expense of a slim look, will leave you spellbound. Place your hand in front of its rear bass port and you will find how much air it is blowing away. According to the manufacturer, its battery life will sustain for 20 hours of playback. We tested and found it nothing but true. Kilburn is not a sealed speaker like its many competitors. If you ever find that the battery is holding less charge, don’t fret, as the battery is easily replaceable. Compare these features with many competing models and it will be a big miss in most of those. For all its design flaws, Stanmore means good sound and vice versa. Wi-Fi is preferred for excellent sound quality and Stanmore exceeds all your expectations on this front. In Stanmore, treble and bass make little tweaks in overall sound. It proves beyond doubt that the manufacturer is extremely confident in its overall balance. The maker has been able to ensure accuracy in its sound field, irrespective of whatever you listen to. The volume is so loud that it can fill up even a larger room. Amazingly, there is zero distortion in sound quality even on its highest pitch. A little complaint about Stanmore is AirPlay takes time (a couple of seconds maximum) on the speaker. We also experienced double start, though occasionally, on Stanmore. We found it great in a multi-room set-up. 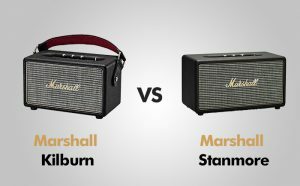 Giving verdict is not easy, especially when you are comparing two speakers from an established name like Marshall. Personal choice matters a lot and your best may be the second choice for someone. But as you expect us to give an unbiased judgment after several rounds of trials and tests, here is what we have to say in this regard. Being heavy and expensive, it might not seem to be a great pick for the Bluetooth-loving brigade. But those were overlooked as sound mattes for a larger pool of customers and on this ground; it’s a damn good model. It’s definitely not in line with the modern-day models in terms of look, but we loved its vintage style and superb performance. Design and performance are two important criteria and from that point, it’s nearly a perfect model worth an investment. Coming to Stanmore, we can only say that it has the signature mark of Marshall. Yes, we admit it’s bulky and not an eye-catcher. But look is not all the customers consider. Just turn your attention to its killer performance. We fell in love with its style including the brass knobs. Those knobs make it super easy to control the speaker. Its lossless sound quality is consistent and impressive. It’s easy to set up the speaker. Its brass buttons are also catchy. Another fact that we loved a lot is the users can daisy-chain the speaker to other devices from the same manufacturer. On the downside, we find it justified about some buyers’ complaint about lack of its remote control. Marshall demands a high price for its product and we’re not complaining. However, the question is how many of you will like to pay that much for it? Between the two, we choose Kilburn. What about you?